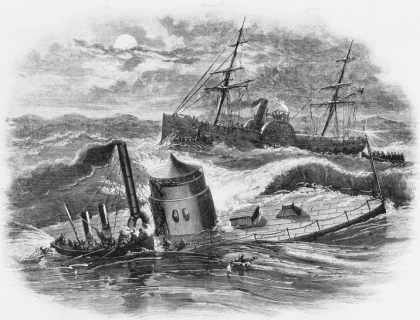 On December 31, 1862, the USS Monitor, sank during a storm off the coast of Cape Hatteras. Four officers and twelve crewmen were lost. A technological marvel in its day, the vessel was designed and built by John Ericsson, a Swedish inventor. In developing the ship, Ericsson obtained 240 patents for equipment, including 45 related just to its turret. Rather than a standard ship hull, the Monitor was a large raft-like boat with a large revolving turret that supported two eleven-inch smoothbore guns. It weighed 987 tons. The first engagement between ironclad ships occurred on March 9, 1862, when the USS Monitor and the CSS Virginia (formerly the Merrimack) met at Hampton Roads, Virginia. After a four hour battle, the Virginia retreated, giving the Monitor the tactical victory. The Monitor was found in 1973, bottom up and in about 240 feet of water. The North Carolina Office of State Archaeology participated in the identification of the wreck. The wreck site, located sixteen miles off the coast of Cape Hatteras, became the first National Marine Sanctuary in 1975. In 2001, the Monitor’s 30-ton steam engine was recovered and the turret was raised from the ocean floor the following year.